One of the most prominent buildings in Prague is the National Museum. 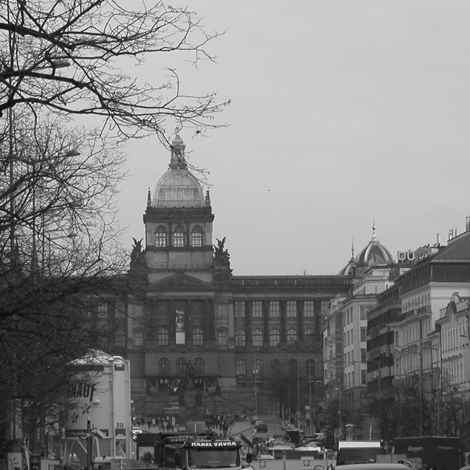 It sits at the end of Wenceslas Square. It was completed in the late 1800's so it’s definitely not one of the older buildings in Prague – even though it looks like something built by a King for a King. The building has been through a lot of hard times. Right at the end of the World War II it was bombed by the German army. It was only one bomb but it did a lot of damage, a front tooth knocked out of a perfect smile. The unfortunate thing is that it was right at the end of the war. The bomb fell on May 7, 1945, the same day that Germany surrendered to the Allies. Then, in 1968, when the Russians drove their tanks down Wenceslas Square, they entertained themselves by shooting at the Museum. No major damages, just some bullet holes in the pillars and outer facade. The holes where fixed, but not perfectly. You can still see the spots where the holes are puttied over because they are lighter in color than the rest of the building. More tests of strength were forced upon the building with the construction of the metro and highway. A big hole was dug near the front of the building causing structural integrity issues. Then right behind the museum a highway was built. Day after day, the museum is suffering from the effects of vibration, dust and noise. I have been to the Prague National museum twice, both times on the first Monday of the month. Because every first Monday of the month the admission is free. The advantage is that it is free; the disadvantage is that it is crowded. The museum is huge and there are lots to see. The history of the Czech lands, a big stuffed Mammoth, rows and rows of geological, paleontological, and zoological exhibits are just a few examples. I remember spending a whole hour looking at rocks and fossilized jelly fish. By the end of the visit, my legs felt like I had been carrying a bag of potatoes on my back all day. My lower back hurt and my throat was dry, standard symptoms of spending a whole afternoon looking at artifacts behind glass. I have been to the museum but I do not need to go there again anytime soon. It is interesting but only if you are interested in Czech history, rocks, and dead animals. If these things do not interest you, there is no point in spending an afternoon of your vacation in the museum. You can get the most out of the museum simply by admiring it from the outside and walking into the front door and gazing at the spectacular main hall with its high ceilings and royal red-carpeted staircases.